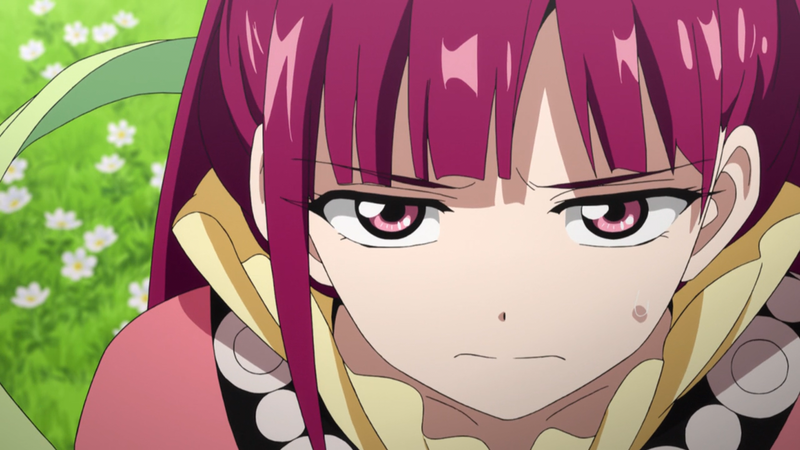 I honestly don’t even remember why I started to watch the first season of Magi, but I did and it’s probably the most “shounen” series I’ve watched since Naruto. Staple themes such as a lead character who was unsure of how to use his powers (and this case, his social status) to best benefit the world were prevalent. 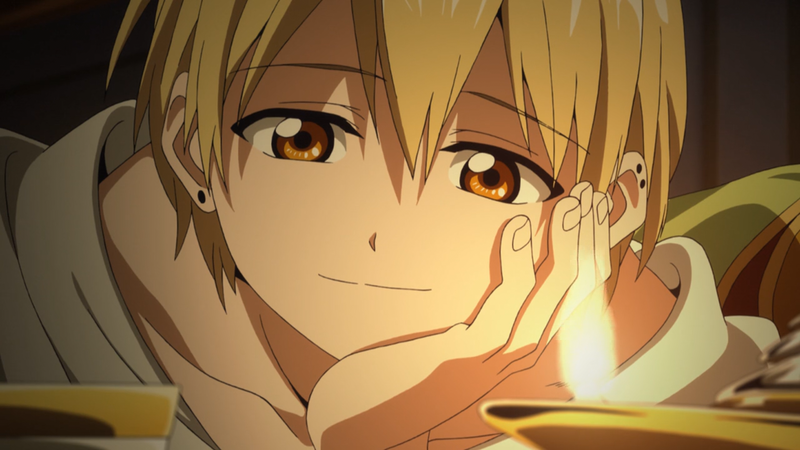 I think what I really liked a lot about Magi is how both Alibaba and Aladdin were the main protagonists, both with fairly different obstacles and motivations. The second season picks up more or less where the first season left off, which is after Alibaba, Aladdin, Morgiana, and Hakuryuu return from Zagan’s dungeon. A little time has past, in which Hakuryuu has trained with his new left arm that appears to be made of animated plant material. They also brought back Dunya from the dungeon, but it seems that the effects of stabbing herself with a dark magic-infused sword have been getting the best of her. It’s a shame because I started to like her as a character, and the foreshadowing is implying that she might not have much longer to live. At least we get to see more of my favorite character, Princess Kougyoku Ren. It’s unfortunate that Sinbad is taking advantage of her using his devilish charm. Sinbad reminds me a lot of Erwin from Shingeki no Kyojin, or maybe the other way around? Not only are they both voiced by the same voice actor, but they both employ morally questionable means to achieve what they believe is beneficial. They both are firm believers that the ends justify the means. On the other hand, we have Alibaba who struggled for an entire season with what he believed was right and wrong. That aside, I love Kougyoku’s reaction when Alibaba steps on her flower. I just wonder when we’ll see her in battle again because sadistic Kana Hanazawa is one of my favorite things in anime. The production quality is very much the same as the last season. To me, that means pretty effects, like the ubiquitous rukh, and slightly off animation for normal seasons between characters. I guess that’s mostly due to the “chibi” moments that are probably used in the manga, and I’m actually a big fan of these. They’re really funny and they remind me a lot of Fullmetal Alchemist. While I know many people who read the manga have been disappointed with the anime so far, I’ve actually enjoyed it so far (I haven’t read the manga though). 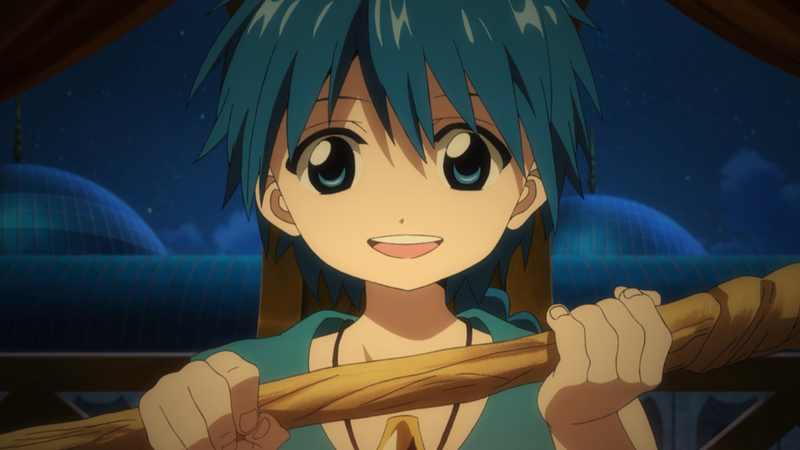 Magi is a “shounen” series that I can get behind, and the story continues to intrigue me. It seems that we’ll learn more about the different magi throughout the lands, and it looks like Aladdin’s going to go on his own pilgrimage! I wonder if this means he’ll disappear and come back out of nowhere or if we’ll see episodes of his journey too. Either way, I’m definitely looking forward to seeing more of this magical adventure.